It is a common misconception that you should begin every maintenance session with the cleaning of the door. The primary task on your agenda should be to look for any problems which may have gone unnoticed during the daily operation of the system. It is best to start from the bottom up. Check the panels and the bottom ends of the tracks for rust. Go over the entire length of the lift cables and watch out for fraying and cuts. If you happen to spot any of these problems, you should get the cables replaced as soon as possible. You should inspect your springs for deformed coils. The extension ones are more prone to this kind of problem. If you identify it, timely spring replacement is essential. You should carefully check the opener’s hardware parts too. Make sure that the rail holding the drive is perfectly straight. If it’s bowed, it will need timely repair. Check the trolley for wearing and deformation. If it is in less than perfect condition, it should be replaced soon or it will break and leave you without an automatic door opening. Once you have checked all hardware parts for damages, you can focus on cleaning the panels. Steel doors are best cleaned with liquid detergent dissolved in water. Use a soft sponge to remove dirt from the panels and remember to rinse them with clean water once you are done. Again, you need to use a sponge rather than the garden hose. If you have a wooden door, you need to clean it with a soft lint-free cloth which is slightly damp. Refrain from using any cleaners as they may cause harm. Remember that wood doors have to be painted every year while steel ones will need to be painted less often. Choose high-quality exterior-grade paint which will provide maximum protection. Do not forget to check the bottom seal and the other weather seals before or after cleaning the door. The best way to do it is to close the door fully while you are inside and the lights are switched off. If you see sunlight coming through the sides of the door, then the weather strips should be changed. Remember to leave any necessary replacement work to the professionals. 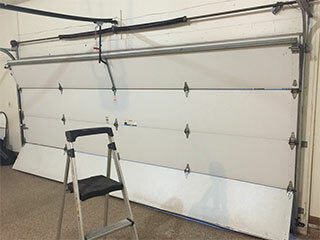 Contact our experts at Garage Door Repair Temecula to assist you.